Zach Villa (right) in the 2015 US film Honeyglue. The cartoon reminds me of a couple, both very attractive, who used to attend Southern Comfort Conference. One year the wife was about three or four months along at the conference and the next year they had the baby in a stroller. 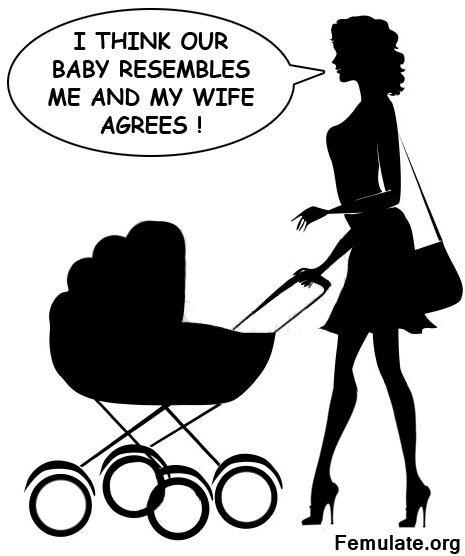 We noticed one day hubby was headed out the door in a lovely dress, heels, nice makeup, an overall a very attractive outfit and pushing the baby stroller heading to the mall across the street. Everyone was of the opinion the baby in the stroller was the ultimate accessory for helping a CD pass.